The above title comes from the song Formaldehyde by a band called Editors. It has the right mix of moody lyrics and an eighties kind of vibe that appeals to me. However I’m not here to recommend songs you’ll be glad to know but, while I was sat in my car driving to a friend’s house one night I was thinking about writing an article on organ donation and I heard that lyric. It seemed hugely appropriate, and I do love a coincidence. I would safely wager that nearly everyone knows that organ donation is where organs are taken from one person and given to somebody else. We know that organ donations can save lives and we know that there is a list, or something like that, somewhere. Personally, I started looking into organ donation as a small project just to understand it better. I know that working in a mortuary will expose me to certain aspects of the organ donation process. Organ transplants started around the 1960s and are now a common medical procedure. To this day, there have been over 1,700 people in the UK that have received a transplant since the 1st April this year. Currently, around six and a half thousand people are awaiting an organ for transplant. While you can donate some organs during your life, like a kidney or sections of liver, organs like the heart can only come from deceased donors and only those who have died in very specific circumstances. 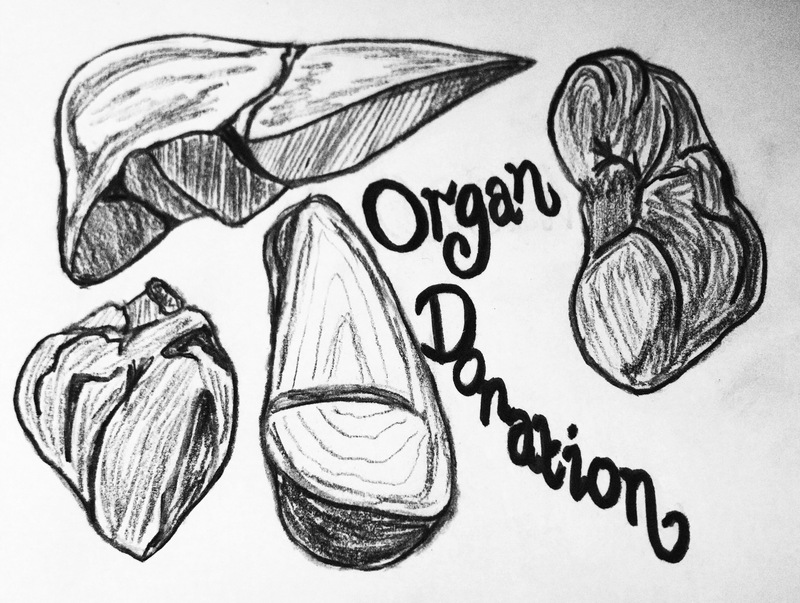 In order to take donations from the deceased they need to have either experienced brain stem or circulatory failure where resuscitation has not been possible or successful. It’s not always organs donated either, a variety of tissues and other parts of the body can be taken, like ligaments or veins. That being said, only around a third of the people in the UK are actually registered for organ donation even though it is thought that the majority of people are in agreement with the process and registering is easy. I don’t think it’s hard to see that we are short of organs to save the people who need them, but it is difficult to understand why so few people are actually signed up. There is a great belief that people simply don’t talk about this enough, and a campaign began to try to encourage people to discuss it more, for example with family at the dinner table. However, it’s understandably deemed by a lot of people that the last thing they want to talk about with their nearest and dearest is what happens when they die. I think this is sad, but I’ve also accepted that my perspective on this is unusual. To counteract the stigma around this, there is now talk of creating an ‘opt-out’ situation for organ donation where everyone is ‘in’ unless they declare themselves otherwise. It’s used in other countries, like Wales for example, and they have found a significant rise in donations once implemented. I guess this plays on the apathy around signing up, switching the focus around and people wouldn’t bother to remove themselves unless they were strongly opposed. I think this would also give the process a sense of normality and therefore be more acceptable to the country as a whole. There are some reasons for being against organ donation, the most common seems to be religion. Effectively, organ donation could be against your religious beliefs, or it could not be as simple as that. It could be considered that by donating you are compromising your access to the afterlife. In addition, there are also doubts around the ineffectiveness of the transplants that occur and that the organ could be rejected. Rejection is also possible at any time, even years after, and medication is required to be taken indefinitely in order to prevent this. For some people, distaste is felt about their body parts being in somebody else or having someone else’s in theirs. From my own perspective, it seems senseless to waste something I no longer have any use for. It’s like taking my old clothes to the charity shop when I don’t like them anymore, or freecycling that old unit because we mounted the television on the wall. I’m not necessarily philosophical enough to be in agreement with the aforementioned song lyric, but I like the concept. This body is mine while I’m using it, but when I’m not anymore I don’t see why parts shouldn’t help someone, or at least give someone hope. The possibility of rejection is there, but it could not be rejected and help someone live. Even though I’ve stated where I am sat on the subject, please don’t think I’m trying to persuade you in either direction. I’d like to think I’ve provided some thought-provoking pointsand if you feel strongly about any of this content please comment below and let’s discuss together! I changed the address in my driving licence this week (about time!) and they ask you if you’d like to join the register. This is something my family have spoken about quite a bit, we would all give our organs, but it’s good to make sure you’re on the resister too I guess. I think they asked me when I signed up for my boots card too!? I’m massively in favour of the opt-out system too. I think most people just don’t bother to have that conversation or think about what would happen. If you were truly and passionate against it, you’d make the effort to get off the list. Maybe they could make some religions automatically off? It just seems such a waste of 2 lives, just because you didn’t want to think about it. I also saw on the news a little while ago about these Olympic style games that were being held. All the competitors were recipients of organs and any medals that they won, the donor families received a medal too on behalf of their loved on. It was really touching to watch. Maybe more people would talk about it if the saw something like that. Awesome! My aim was to get long comments and start a discussion, so thank you for taking the time to write the above. I didn’t know about the driving license registering but someone else just told me about that- I think it’s brilliant. I definitely had the same thing with my boots card but not sure if they still do that or not. It can only be a good thing to talk about it more and make people more aware!